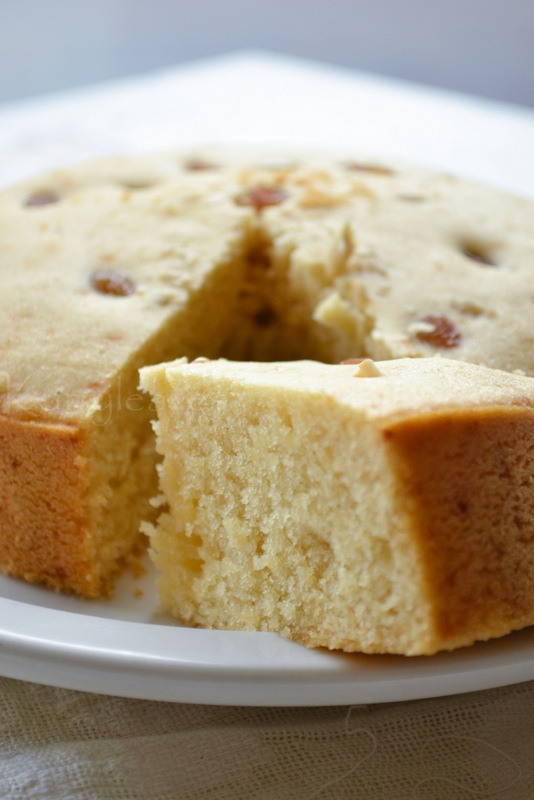 Eggless vanilla cake baked in a pressure cooker. In another bowl,combine together powdered sugar,condensed milk and butter using a whisk.Mix well until combined. In a bowl,combine together all purpose flour,baking powder,baking soda and salt using a whisk.Fold the dry ingredients into the butter mixture in 2 batches alternating with the milk. Add vanilla extract,orange zest ,cashew nuts and raisins.Mix until combined.Do not over mix. 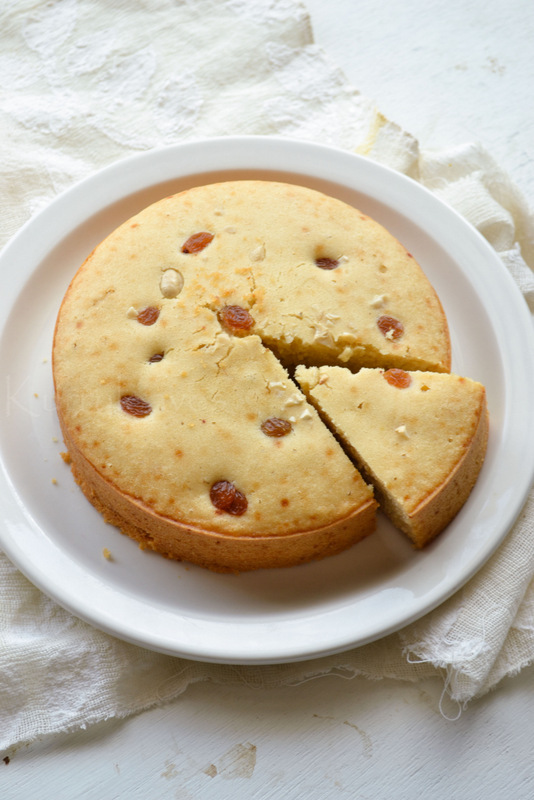 Spoon the batter into the greased cake pan.Top with raisins and cashew nuts ,if desired. Place the cake tin over the grid,in a preheated pressure cooker.Bake on low flame for about 25 minutes or until a skewer inserted into the cake comes out clean. Carefully remove the cake tin.Allow it to cool slightly and invert the cake tin to remove the cake. Firstly add 1 to 1.5 cups salt to the pressure cooker. (You can also use sand instead of salt. )This is done to maintain the heat while baking. Remove the gasket and the vent weight. Place the grid above the salt layer and close the pressure cooker.Preheat the cooker for 5 minutes on high flame. Carefully open the cooker and place the cake tin on the grid , cover the cooker. (Make sure that the cake tin does not touch the sides of the pressure cooker).Reduce the flame to low.Cook for about 25 minutes. 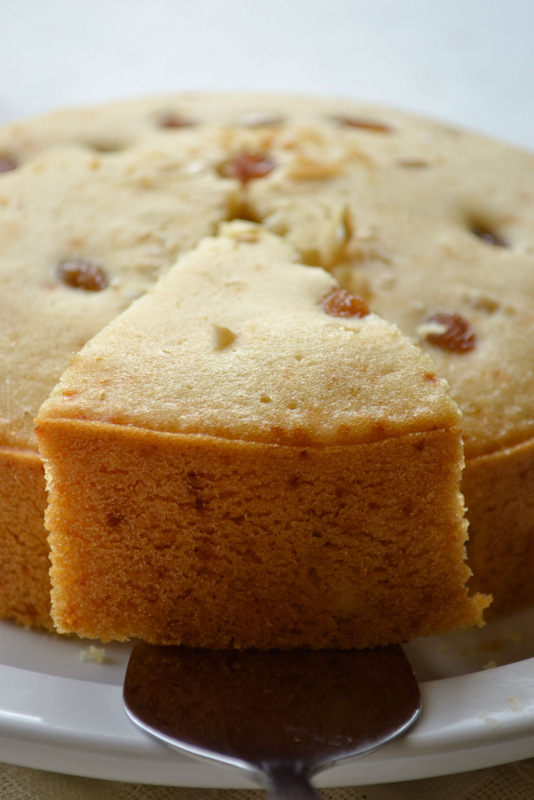 After about 25 minutes,check if the cake is done by inserting a wooden skewer into the center of the cake.If the skewer comes out clean,the cake is done, otherwise cook for another 5 or 10 minutes. ( mine took almost 1 hour over the lowest flame of the stove).The baking time actually depends on the type of pressure cooker that you use and also the temperature settings of the stove.Be careful not to overbake the cake or else it will become too dry. Do not use the rubber gasket and weight valve while cooking. Do not use your pressure cooker to bake on a regular basis,as it can decrease the strength of the metal . Wow, that cake looks gorgeous...I've always wanted to try a pressure cooker cake, just for heck of it :) Planning to try this this weekend. Thank you for the feedback !!! and also be careful not to overmix the batter. The baking powder was fresh but m not sure about the soda. Also, I mixed the batter a lot. Next time, ill change both nd let u know. Hope u ll hear me out. Thank u soooo much. Keep up the good work. So happy to know that it worked perfectly this time...Thanks a lot for letting me know.....Happy cooking..
Is using condensed milk mandatory? Yes!!! here condensed milk acts as the egg substitute..
instead of condensed milk can we use sugar and milk? if so then what should be the quantities of sugar and milk? Yeah !!! you can bake this in an oven at 180 deg C for about 20 to 25 minutes or until a skewer inserted into the center of the cake comes out clean. Hi, I tried the recipe today In pressure cooker and the cake came out perfectly in colour and texture. Thanks for the recipe. Can you pls let me know how to make icing for the cake ? Hi i want to make the same with egg. Can you please tell the procedure? Can we bake this cake in a steel cooker ?